During the musical introduction to The Clockwork Man Betsy Bobbin proceeds to wind-up Tik-Tok who slowly comes to life to the delight of the little girl. And my genius I will show. Always work and never play! Don’t demand a cent of pay! Isn’t that the nicest way? I’m a very clever man! Find my equal if you can! Working on the clockwork plan! He’s a very clever man! Find his equal if you can! When he gets too fast. And a thousand years I’ll last. During the final chorus all of Tik-Tok's actions run down, leaving him helpless, as the Clock Girls finish the number. Early in Act One, Betsy Bobbin, Hank the Mule, and the Shaggy Man discover an odd mechanical man at the bottom of a well. They free him. And after being properly wound-up he proceeds to tell his new friends all about himself. As seen in the photo at the bottom of this page the Clock chorus was made up of pretty girls with clocks for heads. They cheerfully swung their pendulums and held mechanical "crickets" in their hands to make the tick-tock sounds. This charming number has been wonderfully orchestrated for us by James P. Doyle. 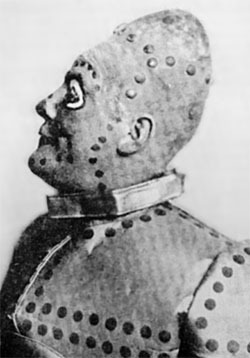 So sit back, play the MIDI and listen as The Tik-Tok Man of Oz comes to life! You may also download the sheet music in PDF format which will allow you to save it on disc or print copies for yourself. 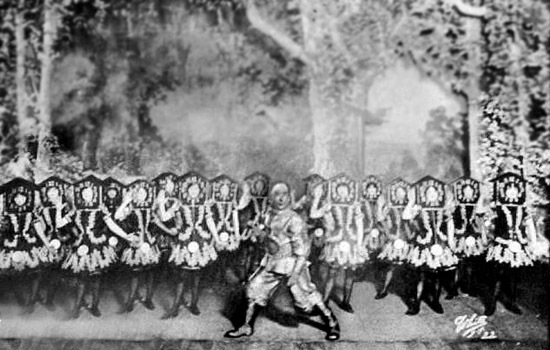 Tik-Tok and the Clock-Girl Chorus perform The Clockwork Man.